Post route map of the states of Ohio and Indiana with Cinncinnati and environs. 1 : 506880 United States. Post Office Dept. 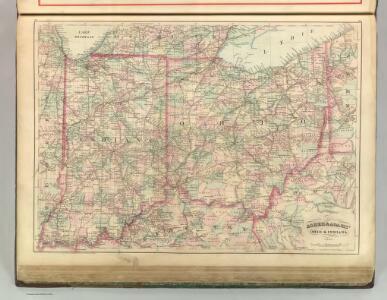 1 : 1712000 Schonberg & Co.
1 : 1800000 Mitchell, Samuel Augustus Jr.
County Map Of Ohio, And Indiana. 1 : 1190000 Johnson, A.J. 1 : 2750000 Lange, Henry, 1821-1893. Map of Ohio And Indiana. 1 : 1820000 Lucas, Fielding Jr.
AutoTrails Map, Eastern Illinois, Southern Michigan, Indiana, Western Ohio, Northern Kentucky. from Supplement to the New York observer. (Indiana, Ohio) Railroad Map of the United States. 1 : 1006000 Johnson, A.J.